I wrote a post the other day about getting the most out of your library, and the very next day I found what I consider to be a HUGE untapped resource that most libraries employ, and I just had to let y'all know about it. When I was working yesterday I sent two patrons to OneClickdigital for books they were interested in that we didn't have physical copies of in the library. After they walked out I started thinking that perhaps I should check it out and see what all they had available. To say that they have a plethora of audiobooks and ebooks to read for free would be an understatement. But the thing I was most shocked by were the lectures from The Great Courses. If you have never heard of the company, they offer college level lectures on over 600 subjects...zero prerequisites, from the comfort of your home. If you remember, I am a huge fan of Gretchen Rubin (I fan-girled hard over here). I really enjoy listening to her podcasts and The Great Courses is one of her sponsors. I had gone over to their Great Courses Plus site to check it out after listening to their ad. With a monthly fee you can watch all you want of their video lectures. I almost signed up...but I know that there would probably be months that I would pay the fee and never watch a lecture...and then months where I would watch a few of them. I felt it was fiscally irresponsible, but I love learning new things...so it was incredibly tempting. 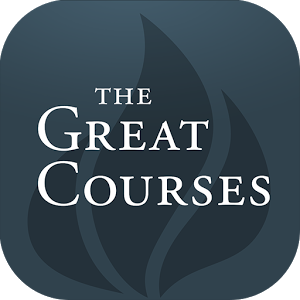 They have over 600 audiobook lectures from Great Courses. And when I say lecture, since this is a book blog, their lecture From Plato to Post-modernism: Understanding The Essence of Literature and the Role of the Author is over 12 hours long. Twenty Three chapters of roughly 30 minutes each. They have subjects from science to history, religion to music, nutrition to book writing and everything in between. I think this is a fabulous resource for people who just have an insatiable desire to learn new things. Or parents homeschooling high school students. Afterschoolers who have a teen interested in delving farther into their favorite subject. And all FREE through your library. So next time you are in your library, ask them if they offer OneClickdigital to their patrons, and let me know what you think. I know every library may not have the program, but if your local library happens to be on a military installation, chances are this program will be available for you.